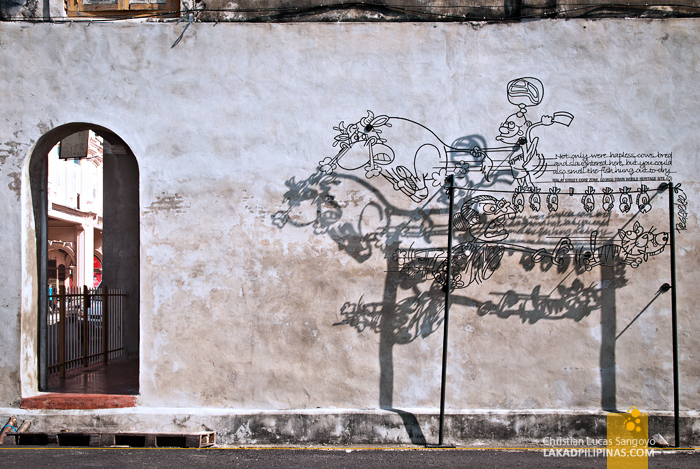 It’s not about its colorfully crumbling shophouses converted into hawker and souvenir stalls, it’s not the intricate temples, it’s not even the centuries old stone fort where the town started nor even its numerous museums; what made Georgetown stand out on the tourist map are its flaky walls. No, they’re not the foot-thick colonial wall types that once protected cities like these from invaders, they’re ordinary walls made from hollow blocks and concrete, but painted with whimsical street scenes of children playing and interacting with real life appurtenances, like in the case of one of the most famous in town, a simple bike standing against a blank white wall. 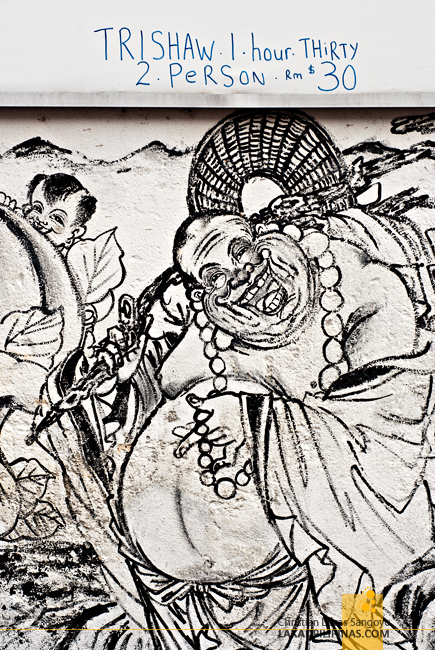 Nevermind that Georgetown has been set by the UNESCO as a world heritage site, what drove tourists here are these paintings, and they’re not about to ooh and aah at the intricacies of each stroke too, what they’re interested in is how they would pose right beside it, as their friend or they themselves, snap a selfie and proclaim that they have indeed visited Georgetown, a UNESCO World Heritage Site. 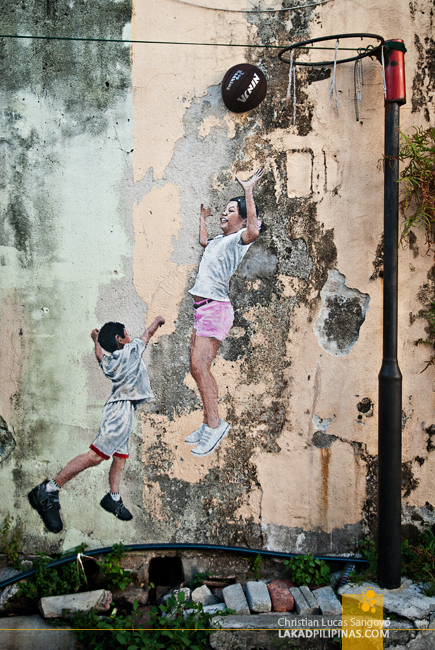 Call me a cynic, but during our first and second trip to Penang’s capital city, that’s how the way I saw the dice roll. 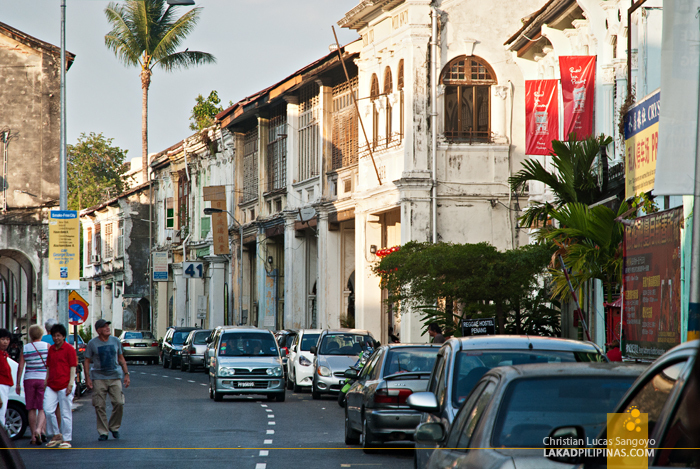 Located on the north east of Malaysia, Georgetown was named after King George III of the United Kingdom. 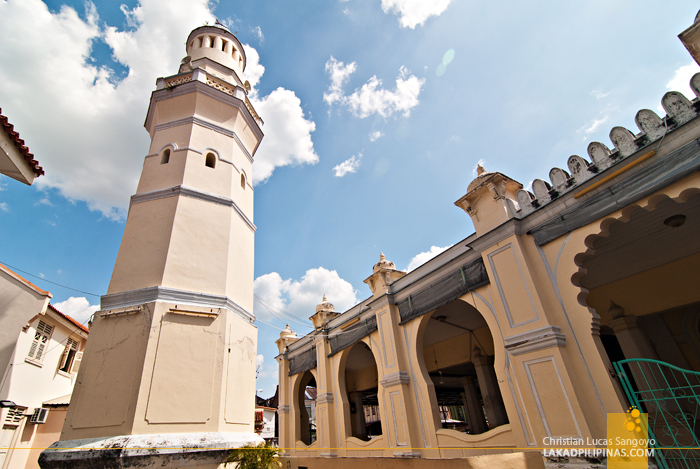 It was used to be part of the state of Kedah (where Langkawi is located), before the British seized it from its sultan, first by diplomacy, and finally by force—with a few dash of diplomacy thrown in for good measure. 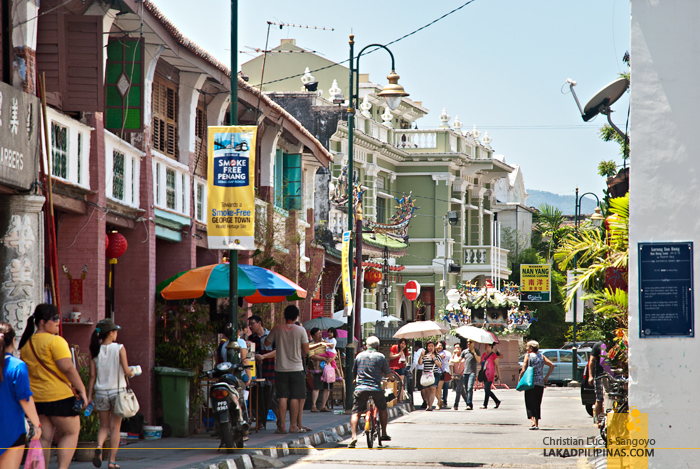 It was founded by a captain of the (in)famous British East India Company, Francis Light, in 1786 to establish a trading port that would rival their Dutch counterparts across the pond at Indonesia’s port of Sumatra, Georgetown would later be part of the British’s Straits Settlements, which includes Melaka and Singapore. 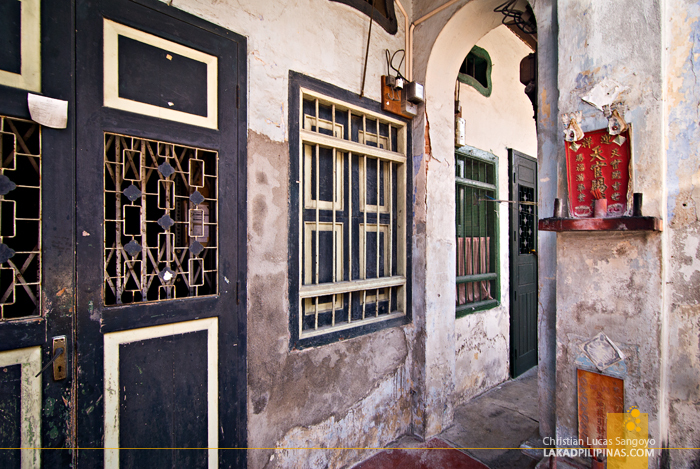 Through the years, the city has seen the outpouring of international and local immigrants into its narrow streets due mostly to the market and opportunities the British brought to the land with their free trade policy; Chinese, Indians, Malays and yes, Europeans too. 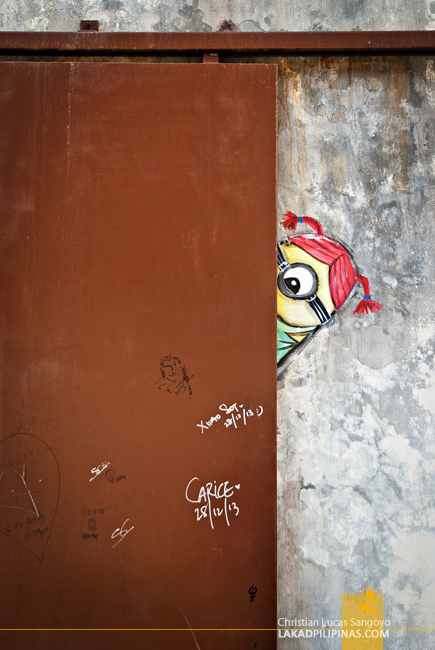 And this cultural mix is what made Georgetown such an interesting place. 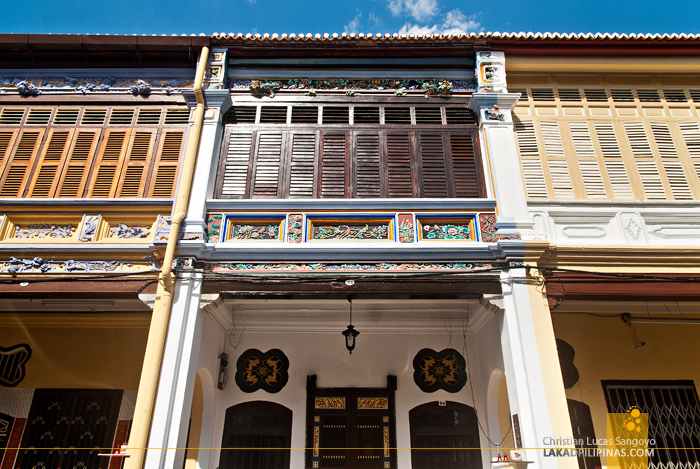 From its ornate and colorful Chinese temples, stately—albeit too narrow—shophouses, the Mamak and Tamil Indian’s temples and cuisine, the mix of Malay and European culture with its handsomely classical structures and clock towers. 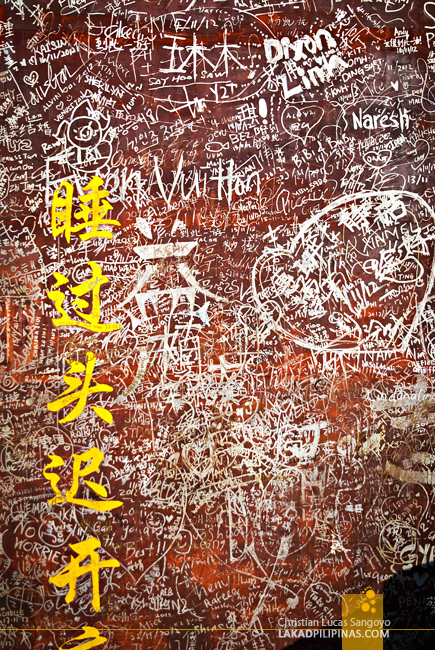 It’s literally an intense boiling cauldron of the east and west, and the broth it brought forth is infinitely fascinating. 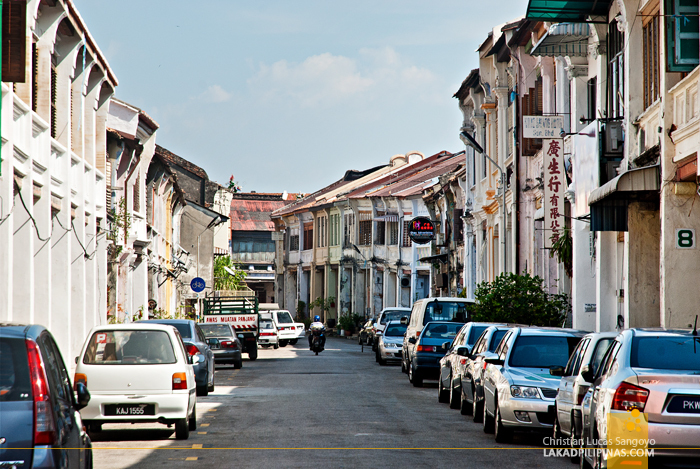 For tourists, Georgetown is a walkable enough place, sans the intense Penang heat, that is. 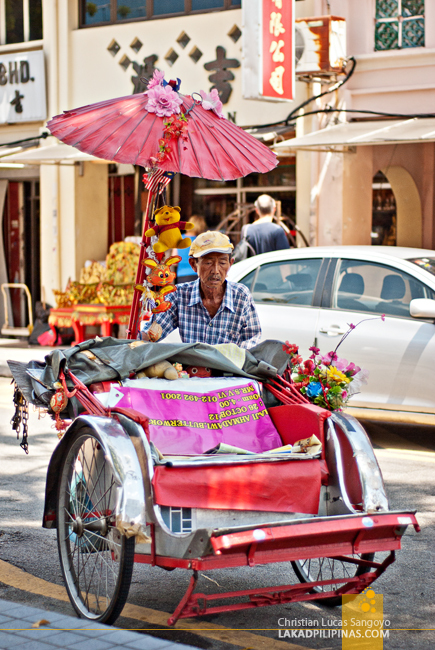 If you don’t fancy bringing an umbrella with you, then you might want to hire a trishaw, a three-wheeled transport which used to be the common mode of getting around Penang. 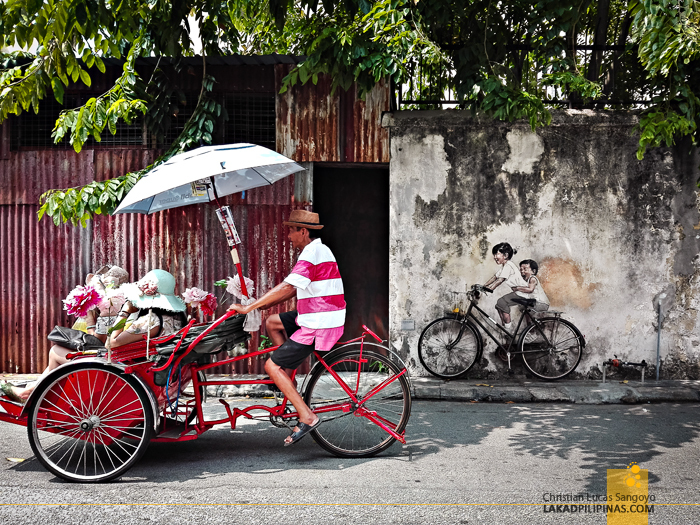 With the advent of modern cars, it has now since been relegated solely for the amusement of tourists visiting the city, complete with colorful fake blooms of flowers on the side. To be fair, Melaka’s trishaws are worse, with Elsa and Hello Kitty’s happily springing forth from its sides along with gaudy music, but I digress, lol. 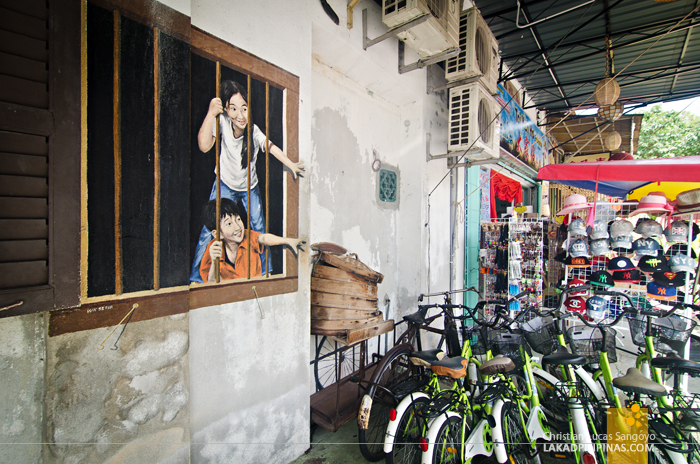 If you find that too touristy as well, like we did—we wouldn’t be caught dead on a Penang trishaw—you can always rent a motorbike or a simple bicycle from one of the many funky hostels at Georgetown’s Love Lane. 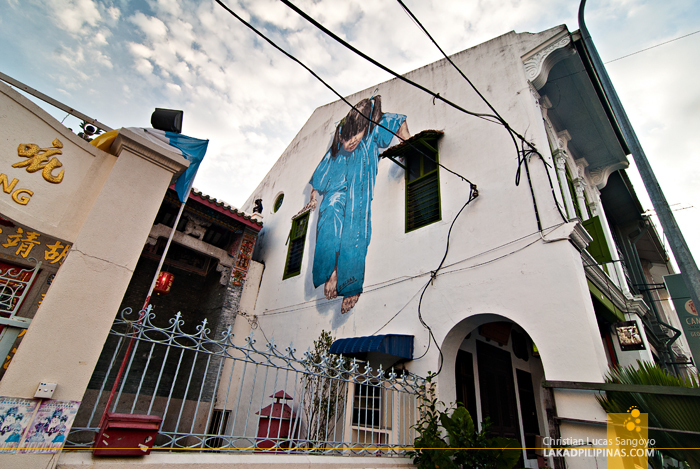 I’ve always been fascinated with the hostels in this area, and on this second trip, we planned on staying on one of the adaptive-reused shophouses, but then E&O Hotel, one of the oldest of its kind in Georgetown invited us to their doors, with the likes of Charlie Chaplin and Hermann Hesse staying under its roof, we simply could not say no. So, finding the trishaw too touristy, the bikes, too much of a hassle, and the motorbike, well, I don’t know how to operate one, we decided to simply walk. 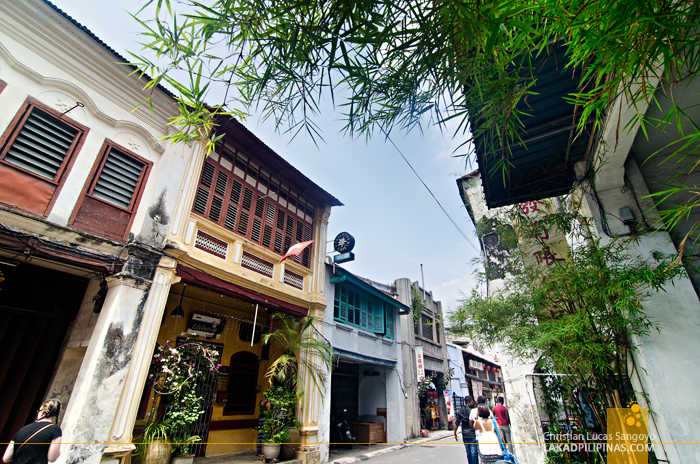 It’s easily one of the best way to explore Georgetown, just be sure to have a hat and ample drinking water to hydrate yourself against the city’s relentless heat. 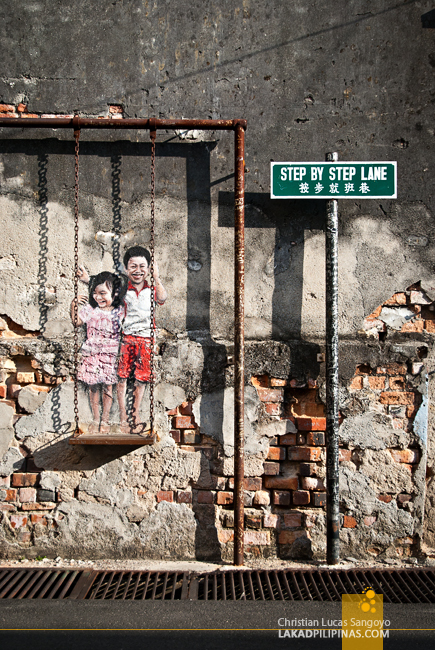 We really have no concrete plans in exploring the historical core of Georgetown, but one soon came forth as we saw a map listing Ernest Zacharevic’s famous street art across the city. 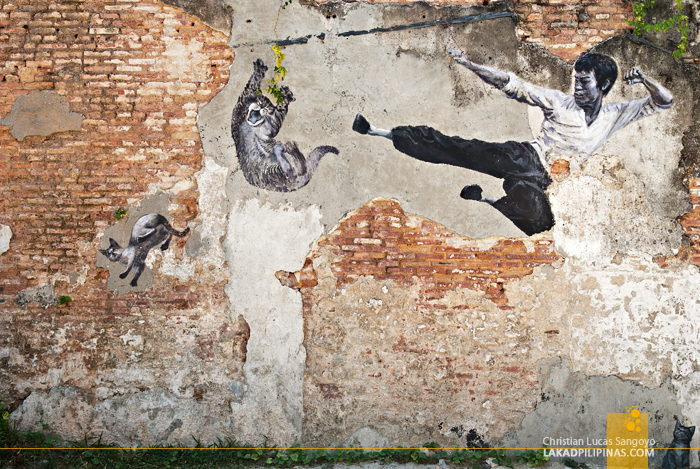 I know, the guy isn’t even from Malaysia but from Lithuana, and that’s a ways away from this place, but somehow, his life-sized and some bigger-than-life street murals has captured the attention of travelers all across the globe. 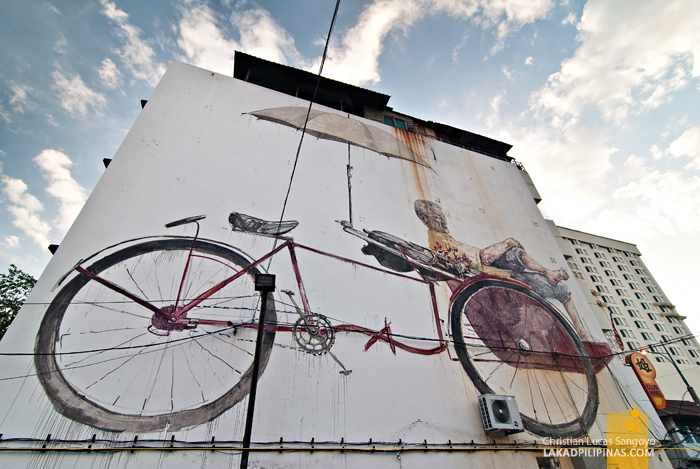 From laughing kids on set on an actual bike, to a lonely boy sitting atop a real motorcycle to a huge mural of a trishaw man resting on his bike contraption above a parking lot; this guy captured the spirit of Georgetown with each rough stroke of his brush. 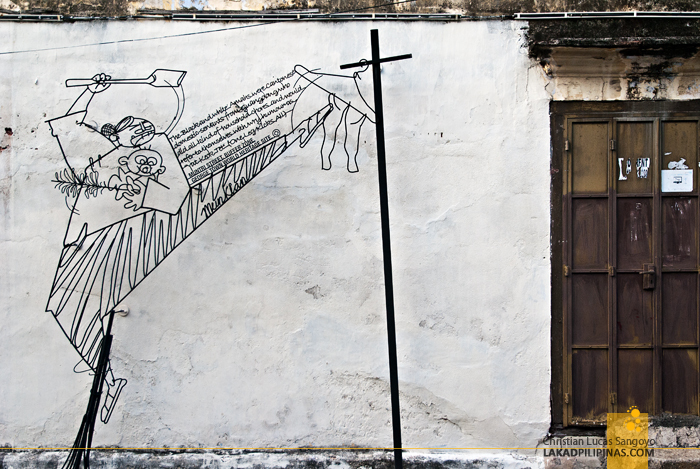 And like tourist lemmings, we got ourselves a Penang street art map, encircled all of Ernest’s artwork locations and proceeded on our merry way across this UNESCO city. To be fair, it was an excellent way to see a good cross-section of Georgetown. 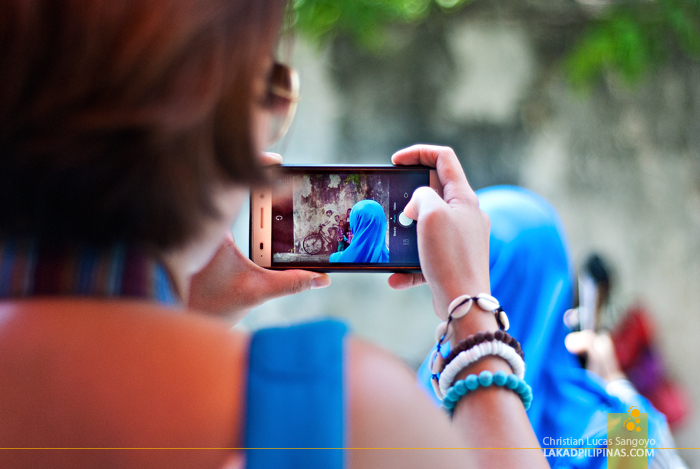 Now, let’s have a selfie.